Well, we are just about finished building our scenario. The only thing left to do is to add our OPORD (Operations Order). An OPORD is a document, usually in Plain Text or HTML format that our scenario will display when it is opened. The OPORD gives the player all of the background information, objectives, and restrictions for your scenario. Because it is in HTML format, you can add any pictures or objects you want to the OPORD very easily. You can also add the OPORD when you create your new scenario. But we think it makes more sense to do it here, at the end of the process because, when you start, you have not created all of the Maneuver Graphics, units, and other objects you will reference in your OPORD. The ATF Scenario Builder does not include a text or HTML editor, so you will have to use some third party software to write your OPORD, before importing it into your scenario. 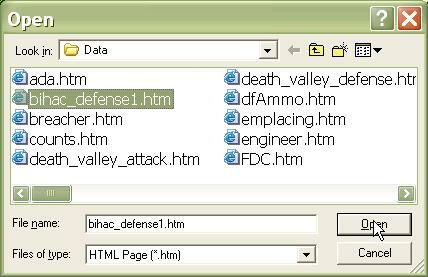 The OPORD must be in the 'Data' sub-directory of the Armored Task Force install directory to be used by an ATF scenario. 1. Write your OPORD using some third party sofware and save it in the 'Data' sub-directory of the Armored Task Force install directory. 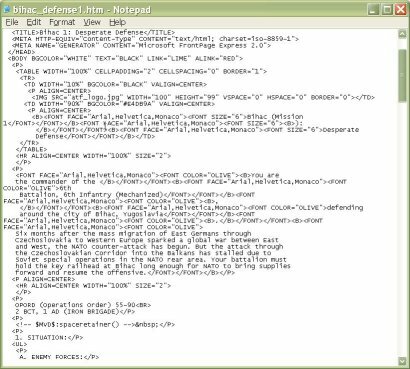 We recommend saving the file using the same file title you specified when creating the new scenario, as it will make it easier to identify that this file is part of the scenario. 2. Select 'Component', 'OPORD', 'Edit', and 'Order'. 3. The Operations Order dialog will allow you to designate the OPORD file for this scenario. The 'Mission' block was filled in by the Scenario Wizard when you created a new scenario. Changing the name here will only change the title on the OPORD window, when the OPORD is displayed in Armored Task Force. 4. Select the OPORD file that you created in step 1. 5. That's it. Select 'OK' and the OPORD will now be included in the Scenario.